Welcome to the Fit Small Business Xero training course! In this lesson, we’re going to cover how to manually enter bank & credit card transactions in Xero. As you learned in the previous lesson, certain transactions must be entered into Xero prior to reconciling your bank/credit card account. For example, invoices and bills should be entered prior to reconciling so that you can easily match them up with the corresponding deposit or check transaction downloaded from your bank. Next, we will discuss when to use each transaction and how to record the transaction in Xero. In general, you should use a spend money transaction to record money spent that is not related to a bill, a bank transfer or an expense claim. To learn how to manage money spent to pay a bill or an expense claim, head over to the previous lesson, How to Reconcile Downloaded Bank/Credit Card Transactions. Bank fees, payments made via check, ATM withdrawals and debit/credit card purchases are just a few of the types of transactions that should be entered as spend money in Xero. For example, if you use the company credit card to buy lunch for the office, this would be a spend money transaction. If you used your personal card, however, this would be an expense claim. Step B – Select Spend Money as indicated in the screenshot below. Step C – Select the bank account where the funds were deducted from & click “Next” as indicated below. Step D – Complete all of the necessary fields as indicated in the screenshot below. Prepayment – A payment that you made in advance of receiving goods or services purchased. For example, a deposit made to secure a caterer for an office party. Xero allows you to apply the prepayment to a future bill or treat it as a refund if it is a refundable deposit. Overpayment – If you paid more for products/services than you were suppose to, you can enter this transaction and reconcile it to the refund (or credit note) that you receive from your supplier. To – Select the payee from the dropdown or add them if you have not set them up in Xero. Date – Enter the date that the payment was made. Reference – Enter a reference # or any additional info in this field. If the payment was made by check, enter the check # in this field. Pay by check – Check this box if the payment was made via check. 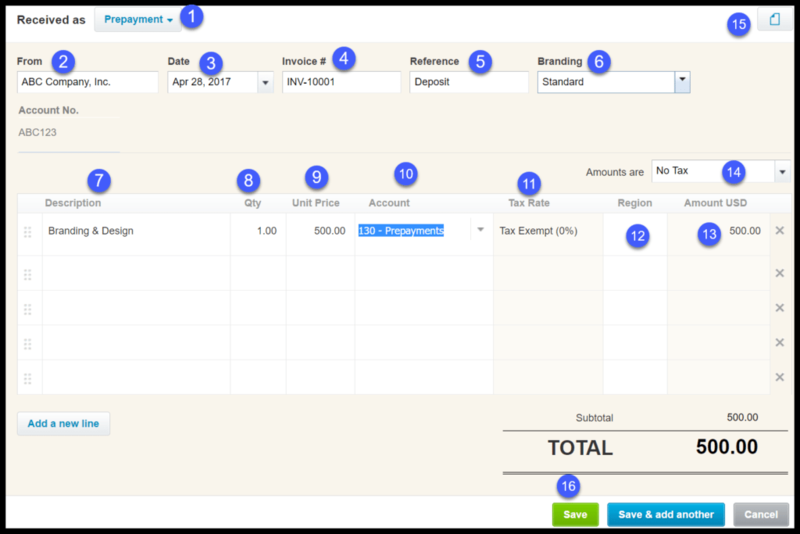 Item – If the payment was made to purchase an inventory item, select the item from the dropdown field. If you have not set the item up in inventory, you can select New Item from the dropdown to create the new item. Check out our how to set up products and services lesson to learn more. Description – If you selected an item this field will autopopulate. Otherwise, you can enter a description in this field. Qty – Enter the quantity of items that you purchased. If a service was purchased, enter a quantity of 1. Unit Price – Enter the unit cost of the items purchased. 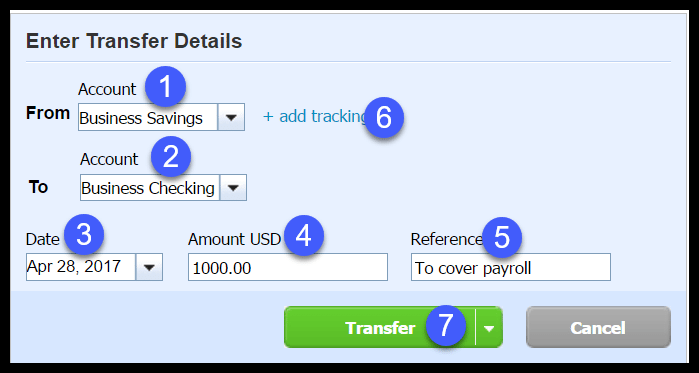 Account – From the dropdown, select the account that you want to use to track this expense. To learn more about accounts, check out our how to set up a chart of accounts lesson. Tracking category – If you want to track income and expenses by department, location, sales rep or another method, select the tracking category from the dropdown. To learn more about how to set up tracking categories, check out the Organization and Financial settings lesson. Amount – Xero will multiply the quantity and unit cost to calculate the amount. Attach File – You can attach a scanned copy of a receipt or other documentation to support this transaction. Note: Use Xero Files to help you stay organized and prepared for tax season! Tax – From the dropdown, select the appropriate tax rate, if applicable. Check out our sales tax lesson to learn more about how to set up, report and pay sales tax. Total – Xero will automatically calculate the grand total of the transaction. Assign expenses to a customer – If you purchased something for a customer, you can flag it as a billable item here. Click the link and select the customer that should be billed for this item. Save – Don’t forget to save your work. In general, you should use a receive money transaction to record cash, check or other deposits not related to an invoice, transfer or refund. If you receive payment at the same time that you make a sale to a customer then you would also record a receive money transaction; this is similar to recording a sales receipt in QuickBooks. To learn how to manage money received for an invoice, transfer or refund, head over to our previous lesson, How to Reconcile Downloaded Bank/Credit Card Transactions. Tax refunds, customer deposits and interest earned are just a few of the types of transactions that should be treated as receive money in Xero. Step B – Select Receive Money as indicated in the screenshot below. Step C – Select the bank account where the funds were deposited to & click “Next” as indicated below. 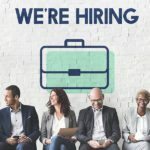 Direct Payment – This could be a payment received at the time of a sale that is not related to an open invoice or a tax refund that you received or interest earned from a savings account. Prepayment – A deposit received from a customer for products or services that you will provide sometime in the future, as indicated in the screenshot above. Overpayment – If a customer overpays you, you can enter this transaction and reconcile it to the refund or credit not that you send to your customer. From: From the dropdown, select the customer or supplier contact you received payment from. If you have not set them up in Xero, you can do so in this screen by typing the contact name and selecting new contact. Be sure to check out how to set up customer contacts and how to set up suppliers to learn more about how to manage contacts. Date: Enter the date that you received the funds. 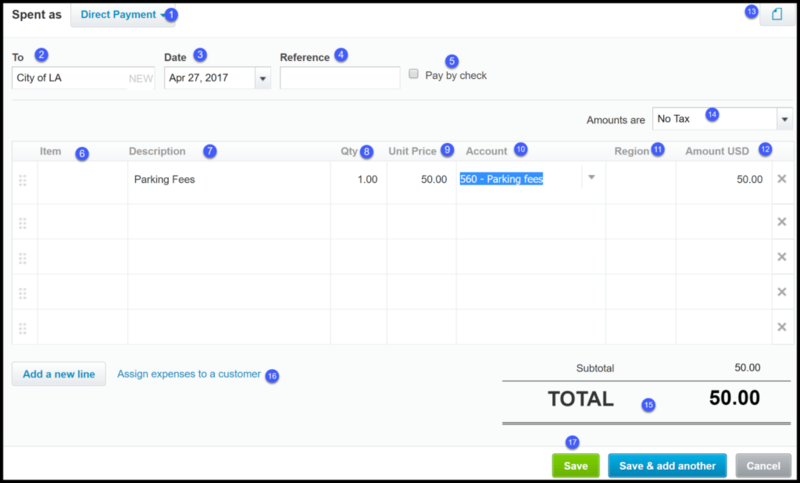 Invoice #: Xero will automatically create an invoice # if the deposit type is prepayment (customer deposit). Note: This field will not appear for Direct Payments or Overpayments. Reference: Enter additional info you want to include about this deposit. Branding: Xero will automatically populate this field with the default branding template you have set up for invoices. Note: This field will only appear if you are recording a prepayment (customer deposit). Description: Enter the description of what the deposit was for. Qty: Enter the quantity for the deposit. Unit Price: Enter the unit price or the total amount received in this field. Account: From the dropdown, select the account that you want to code this deposit to. Note: You should set up a separate account to track customer deposits (prepayments). If you use the default chart of accounts provided by Xero, the prepayments account is already set up for you! To learn how to add, edit and delete accounts, check out the how to set up a chart of accounts lesson. Tax Rate: From the dropdown, select the appropriate tax rate, if applicable. Check out our sales tax lesson to learn more about how to set up, report and pay sales tax. Tracking Category: If you want to track income and expenses by department, location, sales rep or another method, select the tracking category from the dropdown. To learn more about how to set up tracking categories, check out the Organization and Financial settings lesson. Amount: Xero will multiply the quantity and unit price to calculate the total amount for you. Tax inclusive – This option will include tax for each taxable item on invoices and credit notes that you create for customers. Tax exclusive – This option will show tax separately on invoices and credit notes (or purchase orders) that you create. No Tax – Select this option if you are not required to charge your customers sales tax. 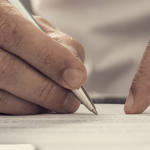 Attach File: You can attach a scanned copy of an approved quote/agreement or other documentation to support this transaction. Save: Be sure to save your work! One of the most common transactions that business owners will do is transfer money between business bank accounts. To record a credit card payment in Xero, you would create a transfer from a bank account to the credit card account you want to make the payment to. Xero makes it very easy to record transfers between accounts that have bank feeds setup. Step B – Select Transfer Money as indicated in the screenshot below. Step C – Complete the details of the transfer as indicated below. From Account: From the dropdown, select the bank account that you are withdrawing the funds from. To Account: From the dropdown, select the bank account that you are depositing the funds to. Date: Enter the date that you transferred the funds. Amount: Enter the dollar amount that was transferred. Reference: Enter any additional info about the transfer in this field. Tracking category: If there is an applicable tracking category that you want to assign this transaction to, click the link +add tracking to select it. Transfer: Click the “transfer” button to save the transfer. That wraps up the section on how to manually enter bank & credit card transactions. The next lesson in our Xero Training Course will be How to Create an Online Sales Quote, Bid or Estimate. In this lesson, we will walk you through how to provide customers with a detailed estimate of a product/service by creating a quote or bid. To access this lesson or any of the others in the series, click here. For a free 30-day trial of Xero, click the link below.